Highway Engineering: Pavements, Materials and Control of Quality covers the basic principles of pavement management, highlights recent advancements, and details the latest industry standards and techniques in the global market. Utilizing the author’s more than 30 years of teaching, researching, and consulting experience, this text focuses on the design, construction, maintenance, and management of pavements for roads and highways, and covers the main topics in highway engineering. Highway Engineering: Pavements, Materials and Control of Quality covers the basic principles of pavement management, highlights recent advancements, and details the latest industry standards and techniques in the global market. Utilizing the author’s more than 30 years of teaching, researching, and consulting experience, this text focuses on the design, construction, maintenance, and management of pavements for roads and highways, and covers the main topics in highway engineering. The author integrates pavement materials, material testing for acceptability and quality assurance, asphalt mix design, flexible and rigid pavement design, construction, maintenance and strengthening procedures, quality control of production and acceptance of asphalts, pavement evaluation, asphalt plants, and pavement recycling. He also includes both European and American (ASTM and AASHTO) standards and practice, and is extensively illustrated with references, tables, graphs, charts, and photographs. 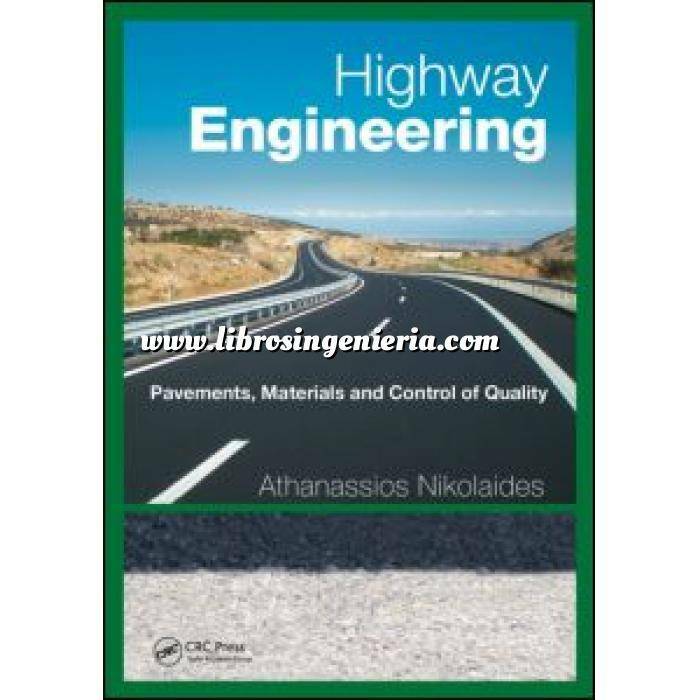 Written for civil engineering students and engineers engaged in highway projects or laboratory testing, Highway Engineering: Pavements, Materials and Control of Quality covers pavement engineering comprehensively as a textbook for undergraduates and graduates, and a valuable reference for practicing professionals. "This new book is a useful addition to the library of books in English about highway engineering, the extensive coverage of which is all highly relevant and should make it a favourite with most highway engineers and engineering students. …Having adjacent sections on the European, American and/or Australian standards and techniques for various aspects makes it very useful to students looking at different approaches, to practising engineers working in different countries, and to researchers looking to extend the knowledge from existing practice. "The most impressive section of the book to my mind, which is not covered in nearly as much depth in other texts, is the treatment of bituminous materials… in particular their characteristics, appropriate methods to characterize their performance in the laboratory, and means of building and maintaining a road using these materials. In addition the book provides a comprehensive coverage of the constituent layers of a road pavement, the material properties of these layers and associated laboratory tests required to characterize these. The different types of methods appropriate to structural design are covered nicely, as are methods of recycling and maintenance."